Originally misidentified as an adrenomedullin receptor, recent observations have revealed that the orphan receptor GPR182 is expressed in stem cells in the crypt base of the gastrointestinal tract. This week in the JCI, work led by Kathleen Caron at the University of North Carolina has investigated the function of GPR182 in these crypt base stem cells, a population notable for high rates of proliferation. Although Gpr182 knockdown did not affect basal intestinal proliferation in mice, loss of Gpr182 was associated with increased proliferation following intestinal injury as well as increased tumor formation in a mouse model of intestinal adenoma. The researchers determined that loss of Gpr182 led to enhanced ERK1/2 activation, suggesting that GPR182 interacts with ERK signaling to regulate intestinal proliferation during regeneration and adenoma formation. These results identify GPR182 as a new potential target of therapies for gastrointestinal cancer. The accompanying image shows a cross-section of a mouse intestine. Non-specific staining of mucous and microbiome make the intestinal lumen visible in the green center of the image. 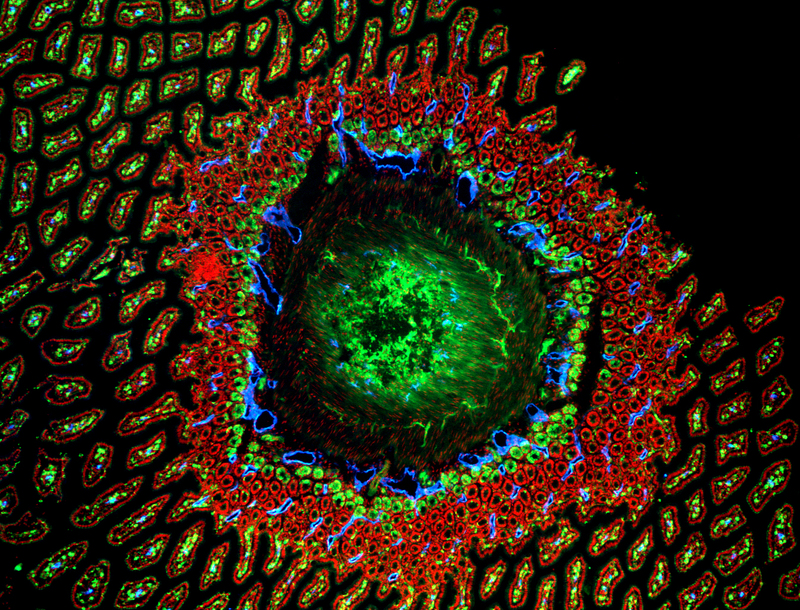 Intestinal villi encircle the lumen, with cell nuclei shown in red and GPR182 expression, localized to stem cells, indicated in green. Lymphatic vessels are indicated in blue. Citation Information: J Clin Invest. 2017;127(2):593-607. https://doi.org/10.1172/JCI87588.